The story’s protagonist, William Manderlay, an elderly musician living in an old people’s home, has been having dreams that he just can’t shake. More like nightmares. During one of these dreams, he meets a Sleepwalker named March, an individual that goes from dream to dream remedying people’s nightmares. It’s here where William’s journey begins. This meeting sparks a chain of events that lead William on an adventure through a world of dreams, all to stop a troubled Sleepwalker named June from releasing a nightmare so frightening that it was locked away in a dream prison called Solomon’s Eye. The journey requires William, because a composition he recorded just so happens to be the map to the desolate and impenetrable prison that holds this nightmare June is so adamant on releasing. Coincidence? I think not. There is so much in this story that is happening all at once, and Langmead trusts his readers to keep up. I like that in an author. Because he knows he’s showing his story rather than telling it in a way that allows you to put the pieces together. The use of God and religion is key, but it took me awhile to realise how exactly. Remember readers, William is dreaming. The world he goes to is beautiful, full of realistic characters, but a place only he could create. What, then, is the point of the story if it is all a dream? Langmead, I believe, is deceiving us to get what he really wants to say across. William is a war veteran, and he always had to leave home to go overseas. Because of that, he lost out on time spent with his wife and daughter. The reader can feel his regret once he explores the death of his wife, and the consequences it had on the rest of his life; a regret to do something differently in life, to wish he could change a moment so that that regret would go away forever. This is where the use of religion comes into play. Langmead uses Thyme, a sort of guide to William, to explain that there are seven Satans all representing a different nightmare God had on his day of rest, and that one of these Satans is trapped inside the prison on Solomon’s Eye. The coincidence that there happens to be seven deadly sins (which we are more knowledgeable of) and seven Satans in this book got me thinking. William is technically dreaming, right? And what does one do when they dream? They sleep. Wouldn’t the Satan that’s trapped on Solomon’s Eye then be Sloth, one of the seven deadly sins? This revelation made sense to me because if you respect the fact that William may just be dreaming, and that everything going on is made-up, then him using a composition he wrote to find a place that is named after his music to stop June from releasing a nightmare that has so much relevance to his life is really him battling against the inevitable. But there’s no escape from the madness, from the old age that has already taken over his mind and led him into the truly dismaying syndrome known as Catatonia—the nightmare he must truly fear. After all, what is Catatonia but the ultimate form of (un)intentional sloth? If you consider all of that and relate it to the rest of the book, Langmead’s message becomes quite clear: do what you truly believe you won’t regret. In William’s case, his regret led him to the point of no return, to a distant memory that caused him to forget everything else going on in the real world. For the depth and absolute profound nature of this book, I don’t have many bad things to say about it. Probably the only issue I had with this novel was that, if William was truly only dreaming, then were characters we met in the dream—like Callister, Captain Reid, and March—real? Or, were they figments of William’s imagination and past meant to lead him to his madness? I believe it’s the latter, but it’s a question we don’t really get a definite answer on, which I can understand being frustrating for some readers. Either way they were strong, believable characters, so that’s a plus for me. In conclusion, I loved this book and recommend it to anyone who wants a book that doesn’t give you all the answers but allows you to figure them out for yourself. The scenery is beautiful and perfectly described for a dream world, the use of imagery to relate certain people and objects back to William’s past is unmatched (for example, the Metronome, the skyship used to sail to Solomon’s Eye), the characters have depth, and the dream is written like a dream: time feels as if it’s speeding up or slowing down, environments change, people appear and disappear, etc. 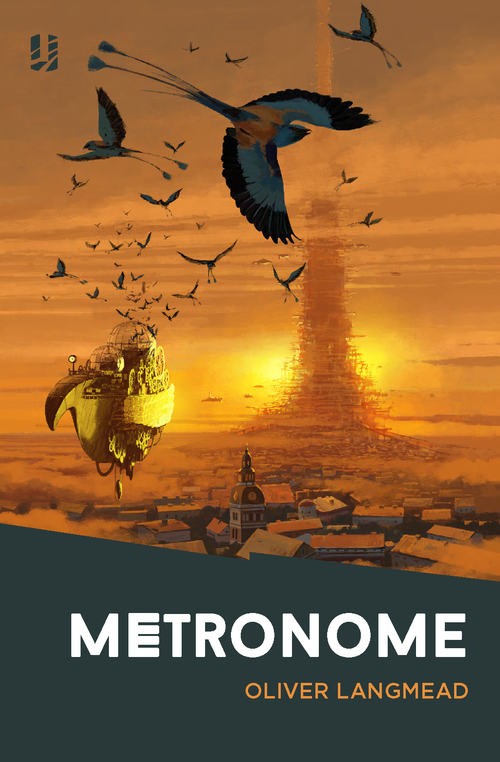 In this novel, dreams play to the beat of a metronome—tick too slowly and you’ll only get so far. But tick too fast and you are bound to lose more than just your timing.